In a production hall as clean as a hospital, pea-size beads of white plastic pour into what looks like a minivan-size Adidas shoe box, complete with 3 white stripes down the side. That’s fitting, because in just a few seconds the machine heats and molds the stuff into soles of Adidas running shoes, with only one worker needed to wedge in pieces of plastic called stability bars. 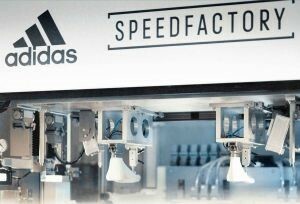 This is Adidas AG’s “Speedfactory,” where the shoemaker aims to prove it can profitably produce footwear in high-cost, developed economies, reports Businessweek (Oct. 9, 2017). By next fall the facility, as large as half a soccer field, will employ 160 people to make 1,500 pairs of shoes a day, or 500,000 annually. The plant, halfway between Munich and Frankfurt, and a twin opening this fall near Atlanta, will be key to Adidas’s effort to catch industry leader Nike. It replaces manual stitching and gluing with molding and bonding done by machines, churning out running shoes in a day, vs. 2-3 months in China and Vietnam, where components are shuttled among suppliers that produce individual parts. “In the history of sneaker making, this is probably the biggest revolution since manufacturing moved to Asia,” says an industry exec. The factories take a page from fast-fashion pioneers Zara and H&M, part of an effort by Adidas to more quickly get shoes, soccer jerseys, and other goods from designers’ sketchbooks to store shelves. Adidas says coupling speed with customization will allow it to sell more gear at full price and keep customers from defecting to rivals. Adidas’s rivals are pursuing similar strategies, with Nike investing in a company making electrical adhesion machines that can assemble the upper part of a shoe 20 times faster than a human worker can. New Balance and Under Armour have started 3D-printing parts of the soles of some shoes. This entry was posted in Domestic Business, International, Manufacturing, Retail. Bookmark the permalink.